Decorating your office or any room in your house with these natural gem displays, gives your environment a serene magical feel to your space. Each gemstone has it own texture, color, and is said to have unique meditative healing properties. If you would like to find out more about the healing properties of these beautiful crystals, there are many books related to this subject; one of my favorite books is called "The Crystal Bible". By Judy Hall. They do look spectacular over a fire place mantle, or on your desk at the office, or in a display case at the cottage. They are also a unique gift idea at Christmas time or birthdays for those who love the sparkle of gemstones. 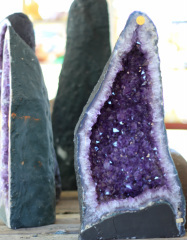 Try to color coordinate the room with a natural Amethyst, a Citrine crystal cathedral, or a geodes (smaller version of it). Some of these crystals are more readily available than others, so depending on the rarity, the quality, the size, the shape and color; the price would vary. Many candle holders are made from these mineral rocks. Himalayan salt candle holders and light lamps glow when they're lit. They are said to produce negative ions that are very healing to many aches and pains. These salt lamps provide a calming effect in any room, are orange in color, and will dissolve if submerged in water. At Christmas time they make the perfect gift. Not only are they unique in looks and shape but they are also affordable. There are also many other types of crystal candle holders and lamp towers like Selenite; it is white in color and also glows when lit. Do not try to wash Selenite with water it will also melt. One of my favorite crystal candle holders is the Flourite it is green and somewhat transparent in color. When the candle light dances inside, different shades of green appear creating an enchanting atmosphere. If you want to know where to purchase such products look for a new age store near you, or use the search engine to find a new age store on line.